Low carb diets are a very healthy option. They are conducive to weight loss, reducing hunger, increasing control over insulin receptiveness and blood sugar. They promote better cognitive performance, and reduce the risk of heart disease. Eating low carb foods can reduce the body’s production and consumption of glucose, which appears to have many thoroughly amazing health benefits. 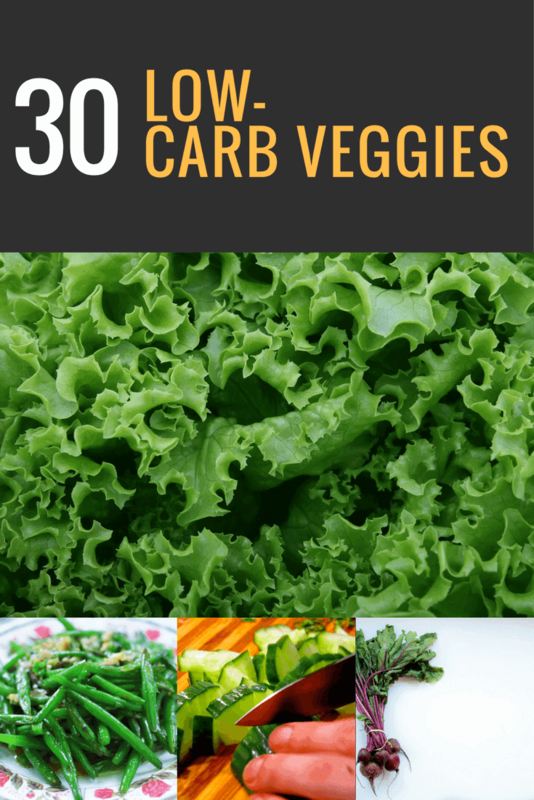 Here are 30 great low carb vegetables and delicious recipes to cook them in! Artichokes are very low in carbs and are quite nutritious. An average artichoke contains 14 grams of carbs, but 10 of those grams are fiber which is really a beneficial prebiotic for the stomach. This makes the amount of carbs that are digestible very small, at only 4 grams. Along with the high amount of fiber, there is also a good amount of magnesium. They are both said to help protect the health of the heart and stomach. Crispy Artichoke Hearts with Horseradish Aioli is a delicious low carb artichoke dish. It is seasoned and crispy, and the sauce offers the perfect kick! Not only is Arugula low in carbs, it is also low in calories. In two cups there are only 10 calories and 1.5 grams of carbs. Arugula a great source for vitamins as well, containing 20% of vitamin A, more than 50% of vitamin K, 8% of vitamin C, calcium, and folate, based on daily recommended dosages. Arugula is usually eaten fresh, but it can also be enjoyed cooked in a variety of dishes. Grilled Steak with Arugula Salad is a great option for a healthy low carb meal. Dressing it with a tangy dressing and fresh parmesan cheese offers a fresh, delectable taste that you won’t forget! Asparagus is a fantastic choice for a low carb vegetable. For every cup there are only 4 grams of net carbs per cup and it is also an excellent source of vitamins A, C, and K. There are many health benefits to be gained from eating asparagus, such as healthier skin, improving regulation of blood sugar, reducing anxiety, and protecting brain health. Low Carb Asparagus Fries are a great alternative to potato french fries. They are much healthier and are low in carbs. They are the perfect snack or side dish and offer a delicious, crispy flavorful taste. Avocado is another great choice for a low carb food, although technically it is a fruit. They only contain 3 grams of net carbs and are very high in good fats, making this a perfect choice for weight loss when consumed in the proper amounts. Avocados also contain 10 grams of fiber, as well as vitamin C and potassium, which help balance electrolytes. If you re looking for a tasty but healthy meal that incorporates avocados, BLT Stuffed Avocados are a great choice. They are low carb, gluten free and are perfect for lunch or even a snack! There are only 3 net carbs in a little under one cup of bamboo shoots, making them an excellent choice for a low carb vegetable. They are also low in calories and sugar with only 40 calories and 3 grams of sugar per cup. And they have an abundance of potassium and protein. They are said to help lower cholesterol, balance hormone levels, aid in weight loss, and are rich in vitamins and minerals. Bean and Bamboo Shoot Chicken Filet is an amazing low carb dish. It is a savory, healthy dish with a flavorful kick that can be prepared with ease. Bell peppers are very commonly used, but many people don’t realize the amazing benefits they can offer. Technically, they are fruit. They only have 6 grams of carbs per cup, and for daily vitamin values, they offer 93% of vitamin A and 317% of vitamin C. Bell peppers are also said to reduce inflammation, decrease the risk of cancer, and help with cholesterol. They contain high amounts of antioxidants, with red bell peppers having the most. If you’re looking for a delicious meal using bell peppers, then the Low Carb Stuffed Bell Peppers is a perfect choice. It is a wonderful dish, packed full of flavor. This vegetable has an extremely low amount of carbs, only 2 grams, one of which is fiber. This is one of the best vegetable options, not only for low carbs but also for many other benefits. Bok choy is high in vitamins C, A, and K, calcium, magnesium, potassium, manganese, and iron. With so many great health benefits, it is a great choice all around. Packed full of flavor and texture, bok choy is the perfect addition to the dish Chicken Bok Choy Low Carb Stir Fry. This recipe is an excellent idea for an easy low carb stir-fry. Broccoli is truly an amazing vegetable. It only contains 6 net grams of carbs, and has 2 grams of fiber per cup. It has a full daily dose of vitamins C and K, and it may be capable of reducing insulin resistance for type two diabetics and help to prevent some types of cancer. For a yummy twist on a classic vegetable, try Cheesy Ranch Roasted Broccoli. It’s a dish that allows you to add a personal touch. 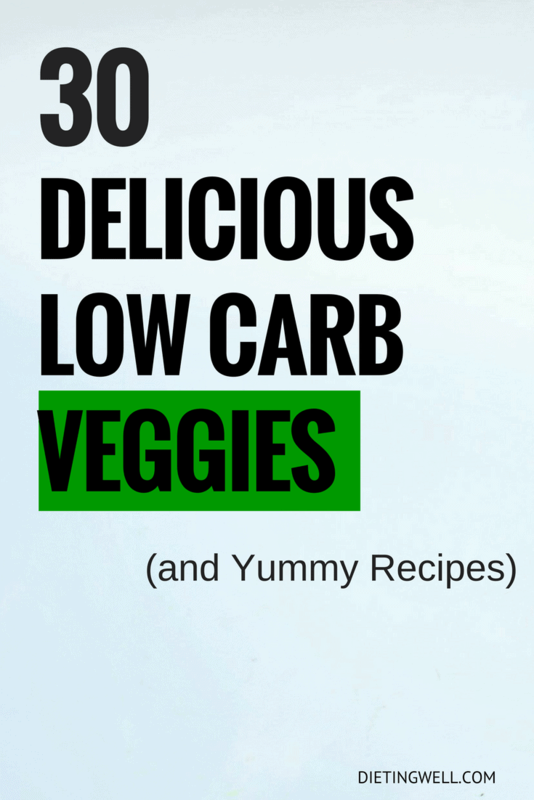 You can add any other veggies or low carb foods! Brussel sprouts are very healthy and packed full of nutrients. They contain only 4 grams of carbs and 2 grams of fiber in every half cup. And they have 80% of the daily intake of vitamin C and 137% of vitamin K. They offer a good amount of folic acid and vitamin B6 as well. Brussel sprouts are also said to reduce risk factors for some types of cancers. If you’re looking for a good way to prepare these, the recipe Brussels Sprouts Casserole Au Gratin with Bacon is an excellent choice. Cabbage also offers a great deal of health benefits apart from the fact that it is in low carbs with only 2 net grams per cup. It is said to help reduce the risk of some types of cancers, such as esophageal and stomach cancer, and it contains high levels of vitamin K and vitamin C.
A great low carb recipe is Creamed Cabbage and Ground Beef Casserole with Bacon. It offers an enhanced southern flavor with zesty cajun spices. It is low calorie and packed with protein, making it a perfectly healthy dish! Cauliflower is an extremely versatile and healthy vegetable. It contains only 2 grams of digestible carbs per cup and is high in vitamins K and C. It is also has 3 grams of fiber and is said to be related to lowered risk of heart disease and some types cancers. Its taste is very mild, making it a great replacement for many high carb foods, such as potatoes and rice. A healthy and low carb cauliflower dish is Loaded Cauliflower. It is a yummy twist on the classic loaded backed potato. Celery is an extremely low carb vegetable, with only one digestible carb and 2 grams of fiber per a 100 gram serving. It also contains 37% of the daily intake of vitamin K as well as luteolin. Luteolin is an antioxidant that has been said to help prevent and help treat cancer. Celery is also very low in calories, making it the perfect snack for any time of day. Simple Cream of Celery Soup is an easy celery recipe that requires very few ingredients and can easily be altered to taste. It is low carb, creamy and delicious! Cucumbers are a fresh and healthy low carb vegetable. A cucumber with the peel contains only 3.63 grams of carbs per 100 gram serving and only 2.16 grams of carbs peeled. Cucumbers also contain 1 gram of fiber and cucurbitacin E. Cucurbitacin E has been said to have a positive effect on overall health. Cucumbers have also been said to protect against cancer, have anti-inflammatory properties, and might have positive effects on brain health. A light, crisp, refreshing dish using cucumbers is Cucumber Tomato Avocado Salad. It’s low carb and very nutritious! Eggplants are a great vegetable that can offer some impressive health benefits. They are low in carbs with 6 digestible carbs per one cup serving and 2 grams of fiber. Eggplant is also said to assist in lowering cholesterol and improving heart health. It also contains nasunin, which is an antioxidant that is said to reduce free radicals and protect brain health. Low-Carb Eggplant Pizza Bites are a delicious eggplant dish that can be make with 6 simple ingredients. It is the perfect recipe for a healthy snack or meal. Garlic is a simple and flavorful low carb vegetable that is easy to add to any dish. One clove only contains 1 gram of carbs, some of which is fiber. It also has other health benefits, such as making the body more resistant to the common cold and lowering blood pressure. Garlic has also been said to help in regulating blood pressure and maintaining blood sugar levels. The recipe, Cheesy Garlic Bread Muffins offers a delicious, melty, cheesy treat. It is a healthier option compared to traditional garlic bread. Green beans are a versatile ingredient and can be used in all sorts of dishes. Their net carb count is 4.27 grams with serving sizes of 100 grams. With 2.7 grams of fiber and loads of chlorophyll, green beans provide many great benefits for the digestive tract and your body as a whole. Carotenoids are also present, which have been observed to maintain the mind’s health through the years. A great low carb recipe choice with green beans is Crispy Oven Fired Green Beans. This dish is gluten free and is simple to throw together, making it perfect as an appetizer or a side. Kale might be one of the healthiest options out there. This vegetable has a wealth of antioxidants, including quercetin and kaempferol, which are beneficial for the heart, skin, immune system and so much more. An added perk is its ability to protect against type 2 diabetes. In a 100 gram serving, Kale contains 8.75 grams of carbs, 3.6 grams of which are fiber. A delicious dish made with kale is Kale with Bacon and Garlic. This dish is a healthy casserole-like combination that is sure to please the palate as well as your body. 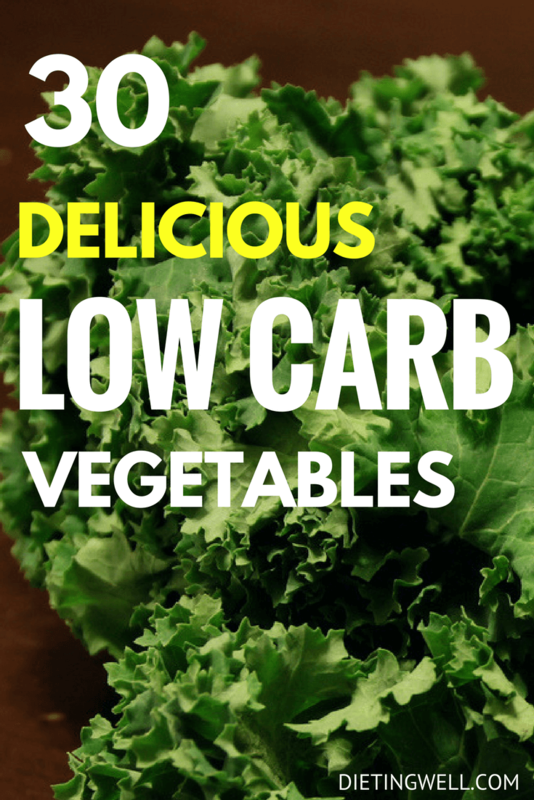 Lettuce, to no surprise, makes this low carb veggie list. Now there are variations of lettuce, meaning that they do not all offer the same vitamins and minerals, so make sure to keep an eye out while shopping. The darker green variations, such as romaine, provide an abundance of vitamins K, A, and C. Folate, a B vitamin, is also present and has been observed to reduce heart disease risk. On average, half a cup of lettuce contains .5 grams of net carbs making it one of the lowest carbohydrate vegetables around. Low Carb Lettuce Burgers is a great healthy recipe to include in your routine. Raw mushrooms contain about one gram of net carbs and one gram of fiber in each cup. The variety available is extensive and offers a great many options in preparation. Commonly observed health benefits include strong anti-inflammatory characteristics and aiding those with metabolic syndrome. An excellent recipe idea using mushrooms is Spinach Artichoke Stuffed Portobello. They are perfect as an appetizer or a side dish. This vegetable contains 6.31 grams of carbs, of that 2.80 grams are fiber. Mustard greens are a gold mine of antioxidants, such as quercetin, kaempferol, ferric acid and isorhamnetin, which help many of the body’s systems. Also found in this vegetable are vitamins K, A, C, E, as well as a long list of minerals. With only 3.51 grams of digestible carbs, mustard greens are a very healthy and nutritious meal ingredient. A great low carb meal idea would be Salmon & Mustard Greens with a Warm Vinaigrette. Olives are a great low carb snack option. The nutritional properties of olives depends on the preparation. Generally, the benefits and nutrients are consistent among the variations. A serving size of 100 grams, a little less than one cup, has 6 grams of carbs, 3.2 grams of which are fiber. Anti-inflammatory benefits have been observed, which means this vegetable has allergy fighting properties. Olives also have cancer fighting properties thanks to phytonutrients like hydroxytyrosol. Olives are a very flexible snack, garnish, or side. A good snack or appetizer option would be Black Olives with Cheddar. Onions are a great low carb ingredient with limitless versatility. In a 100 gram serving there are 9.34 grams of carbs, of which 1.7 grams are fiber, leaving us with a total 7.64 grams of net carbs. The antioxidants found in onions have observed benefits such as lowered blood pressure, reduced LDL cholesterol levels, and improved regulation of blood sugar. A fun fact about onions is that they have been used for hundreds of years to heal ailments and help swelling. A fun and tasty way to prepare this vegetable would be the low carb Cajun Onion Rings recipe. Radishes are a great low carb option to flare up many dishes. They have an unforgettable zest and for a serving size of 100 grams they provide 3.4 grams of carbs, of which 1.6 grams are fiber. These veggies are typically eaten raw but can be prepared in a variety of fashions and provide an assortment of vitamins and minerals. Radishes have observed benefits for the liver, digestive and excretory systems, kidneys, and are great for weight loss. A wonderful preparation idea is the Pan Roasted Radishes recipe. Snow peas offer 7.5 grams of net carbs with 3 grams of fiber in a 1 cup serving. These veggies are great when considering various combinations of snack options. They contain various vitamins and minerals that have been found to promote weight control, give the body what it needs to clot properly, and help the body convert food to energy. Something worth mentioning is that researchers have found substantial changes to the nutritional value of snow peas based on how long they have been stored. This Low Carb Shrimp and Snow Peas recipe is sure to satisfy. Raw spinach has 1.43 grams of net carbs and 2.2 grams of fiber in a 100 gram serving. Cooked, this vegetable looses some volume thus slightly increasing the carb ratio with respect to volume. Spinach contains a large concentration of vitamin K. With its large assortment of other vitamins and minerals to boot, spinach is able to promote the betterment of the body’s functions, some of which are responsible for clotting, heart health, skin protection, fetal development and many more. This vegetable is famous throughout the world for increasing overall health. Stuffed Chicken with Spinach and Tomatoes is a low carb recipe you won’t be able to get enough of! Dense with nutrients and containing only 2.14 grams of net carbs per 100 gram serving, Swiss chard is an amazing low carb vegetable that has more than a recommended day’s worth of vitamin A. Additionally, the abundance of vitamin K found in Swiss chard has been found to support bone health. It is recommended to boil the chard to release some of the acidic compounds to allow for the sweeter side of the vegetable to be appreciated. A great low carb breakfast recipe is the Swiss Chard Ricotta Pie with Sausage Crust. A serving size of 100 grams of tomatoes has only 2.69 grams of net carbs and 1.2 grams of fiber. The tomato is a famous fruit in a vegetable suit and provides many wonderful health benefits. Such benefits include, but are not limited to, reducing blood pressure, helping to prevent prostate cancer, decreasing stroke risk, and strengthening of the walls of your arteries. By using oils with tomatoes in recipes, you can boost the absorption of lycopene, the cancer fighting antioxidant. This recipe for Caprese Baked Tomatoes is a quick and easy to put together appetizer or side and it resembles pizza! Similar in some ways to the potato, turnips provide 1.8 grams of fiber and 4.63 grams of net carbs in a 100 gram serving. With its abundance of calcium, vitamin C, iron, and fiber, turnips provide a great many health benefits which include bone strength, immune support, circulatory support, and digestive efficiency. A savory side recipe you need to try is Fried Turnip “Potatoes”. The unique watercress provides 0.5 grams of fiber and 0.79 grams of net carbs per 100 gram serving. The extensive benefits this vegetable offers include reducing risk of depression, improving bone health, reducing risk of heart disease and cancer, and provides relief from pediatric asthma. A tasty recipe that utilizes this amazing vegetable is the low carb Watercress Soup with Soft-Boiled Egg and Parma Ham. Zucchini is an excellent low carb vegetable providing 2.11 grams of net carbs in every 100 gram serving. This vegetable has been seen to promote weight loss. The vitamin and mineral contents in zucchinis, such as manganese, vitamin C, zinc, niacin, omega-3 fatty acids and many more, have been observed to have outstanding cardiovascular wellness effects. An innovative pizza-like, low carb recipe idea is the Zucchini Pizza Boats. You’ll love this delicious twist on traditional pizzas. Most low carbs vegetables are also low in calories, making them very beneficial to incorporate into a diet. They offer a variety of health benefits, ranging from reducing the risk of certain diseases to positively impacting your overall health. Low carb vegetables can provide the body with many of the important nutritious aspects that it needs to function properly and would be the best type of foods to incorporate into a diet for overall good health. Is your favorite veggie missing from the list? Let me know in the comments section below!